At Delft Cybernetics, over the years we have developed some useful resources that are perhaps also of use to others. 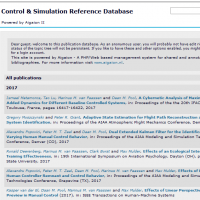 For example, we (try to) keep an up-to-date overview of all scientific literature related to our research in our CS Reference Database, where you can find nicely formatted bibliography information and pdfs (only with NetID access) of our many collected papers. We publish the links to such useful resources on this website.